John S. Bowman Jewel Bourbon sign. John S. bowman was a wholesale liquor and wine dealer in San Francisco from 1886 to 1892. 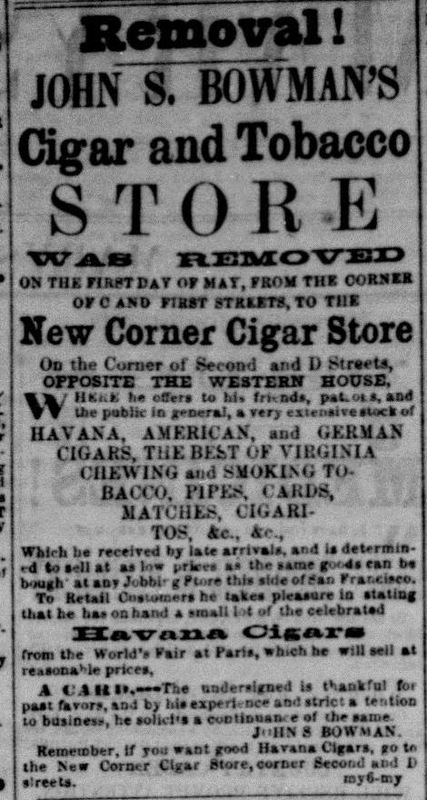 He also dealt in the bitters market for a brief period (Jewel bitters ) His wholesale liquor outlet was at 213 Battery Street. In the brief period that he was in business he produced at least five embossed bottles to advertise his products. The first known Jewel Old Bourbon fifth was dug near Silver Peak Nevada in 1969. A few years later one surfaced in Quincy California. Since these first discoveries other examples have been found in Nevada and northern California. As of 2002 there are seven ? known examples. The Jewel Old Bourbon flasks are amber and have a tool top and they only occur in the pint size. At least three of these flasks have been found along the Salmon River in northern California. One other Jewel flask is known to have come from the old ghost tow of Bellville Nevada. As of 2002 four of the Bowman Old Jewel flasks are known.